At Pennella's Landscape Designs, LLC, We feel as if every house is different and unique, by implementing your dreams and goals for your property, we create a design that is to your specifications. From the initial meeting, all the way until the final steps of the job, our client to owner ratio exceeds that of any other. During the Landscape Construction part of your project, Pennella's will be there with you every step of the way. Each job is unique and many jobs are changed and upgraded often during the Landscape construction process. We can assure you that if you have any questions about your project we will be there to assist you. At Pennella's Landscape Designs, LLC we understand how important it is for you to have an attractive landscape week after week. That's why our extensive maintenance plans and trained landscape professionals can assure you that every aspect of your property will be left in pristine condition. Outdoor lighting brings an added beauty to your home after the sun sets, your home becomes illuminated giving a warm welcoming feel. 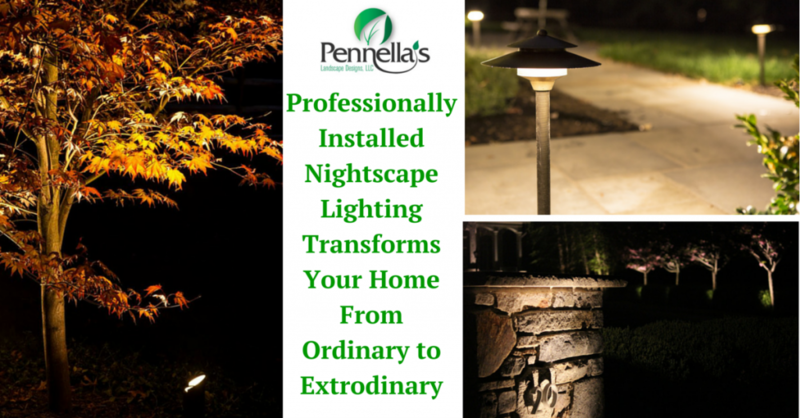 Let Pennella's add a complete outdoor lighting system to your home! Outdoor lighting systems dont just light up your home at night, they bring your home ALIVE! Another winter season is fast approaching and the Pennellla's Landscape Winter Team would like to take a moment to introduce our company, emphasizing the benefits our company has to offer from contracting with us for our snow removal and de-icing services. Our Winter division is the company to choose when deciding on a snow management firm.